Efekt póki co nie jest znany. Jedyną wiadomą rzeczą jest to, że będzie on lvl 2. tunerem! Źródło: To napewno nie ma nic wspólnego z nowym SD-R! (1) If a Zombie monster other than this card is Special Summoned from your GY while this card is already face-up: You can draw 1 card, then discard 1 card. 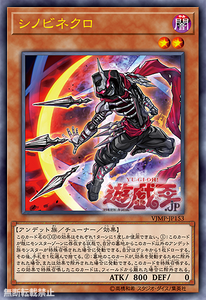 (2) If this card is banished from the GY either to activate a card effect, or by a card effect: You can Special Summon this card, but banish it if it leaves the field.